The class of 2018 Aboriginal Trainees has left a lasting legacy at the Centre for Education and Workforce Development (CEWD), after helping to design and name a new cultural garden. Tyler Blah documents his leukaemia diagnosis and treatment to help others confronting life-changing illnesses. It was an engaging, informative and colourful day at our 3rd annual Equity Fest, an event designed to encourage and develop partnerships to foster health equity. It was an inspiring and uplifting day as we celebrated the achievements of the class of 2018.16 trainees in Health Administration and Health Services Assistance are now well on their way to a new career in health. March Arts 2019, that's a wrap! Our annual March Arts celebration has wrapped up, after 59 exhibitions at 8 venues. March Arts is a fun and colourful showcase of the talents of our staff, our patients and our community. It's also a reminder of the benefits of integrating the arts in to healthcare. A mural by Aboriginal artist James P. Simon has been unveiled at the Concord Centre for Palliative Care. The artwork has been designed to make the Centre a place where Aboriginal people feel safe, welcome and respected. There was a focus on suicide prevention and building strong families at Sydney Local Health District’s 2019 Close The Gap Day event. Our innovation challenge is back for 2019, and the first winning idea is one that will engage all five senses. A message from the Chief Executive on International Women's Day. Concord Hospital Redevelopment reaches a major milestone as main works begin. Researchers and clinicians collaborate to launch the Institute for Musculoskeletal Health in Sydney. Christmas Carols and Classic Hits. It was an evening of great music and festive family fun at our annual Carols at Yaralla. Were you there? Can you spot yourself in the crowd?. We thank our volunteer visitors who provide companionship to those living in aged care facilities. A rap song to encourage fuss-free family meals, a heart-health app for new mums, and another app to help intensive care patients communicate with staff are some of the winning ideas that will be developed, following the latest round of The Pitch. Volunteers celebrate 25 years of visiting isolated aged care residents from diverse backgrounds. When do you see a jumping castle on a Hospital front lawn? When it's Open Day at Canterbury. Have a look at some of the fun we had showcasing our services to the community. How can technology drive personalised models of health care? Two leaders in the field shared their experiences at a key Digital Health and Informatics Network (DHIN) event, hosted at RPA. Celebrating 100 years since the guns on the Western Front fell silent and a signed armistice brought an end to the Great War. A plan to inform, empower, connect and influence young people in Sydney's Inner West. Visiting hospital has never been so much fun! See what we got up to at RPA's 2018 Open Day. 9 out of 10 women who develop breast cancer do not have a family history. October is breast cancer awareness month. If you're aged 50-74, book your free BreastScreen. From a miracle baby to the latest in Aged Care and dementia research; AGM 2018 offered a fascinating and inspiring look at some of the work being done by our dedicated and skilled clinicians, and how that is helping to improve the lives of our patients and their families. Meet Kim. She's just one of the dedicated support staff who come to work each day to help Sydney Local Health District's executive team and clinicians to continue to provide high-quality, patient and family centred care. Bevan Rankins has his mum to thank for his life-changing decision to come and work in Sydney Local Health District. And he wouldn't change a thing. Meet Simona. She's one of the passionate and dedicated Sydney District Nursing staff who provide at-home care for our patients. In her words, it's a job she's proud to have. A very special smile now awaits visitors to Sydney Dental Hospital. A dedicated concierge is there to lend a helping hand to patients, families and carers, who can sometimes be in great pain or have travelled long distances. Innovation Week 2019 – Save The Date! We're excited to announce that Innovation Week will return in 2019, building on this year's successes and promising many more inspiring moments. Minister for Health, Brad Hazzard toured the Concord Hospital Redevelopment site and unveiled plans for Australia's first comprehensive centre for veterans and their families. 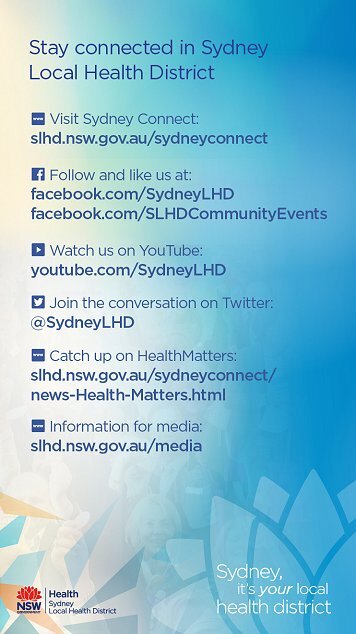 The CHAT initiative has launched across Sydney Local Health District, supporting local carers in their work. Did you know 9 out of 10 women who develop breast cancer do not have a family history? October is breast cancer awareness month - if you’re aged 50-74, book your free BreastScreen. Nearly half of all Australians will experience mental illness in their lifetime. We're being encouraged to 'Share the Journey' this Mental Health Month. The magnificent Thomas Walker Estate comes alive with spectacular floral and gardening displays. A replica fireplace and bright tablecloths will add a homely touch to a hospital stay for dementia patients, thanks to one of the winning ideas from The Pitch. Nearly half of all Australians will experience mental in their lifetime. We're being encouraged to 'Share the Journey' this Mental Health Month. Did you know 1 in 8 women in NSW will develop breast cancer? October is breast cancer awareness month - if you're aged 50-74, book your free BreastScreen. Healthy family fun in the spring sun for people and their pooches. During Multicultural Health Week, we gathered with groups and communities to celebrate diversity at our annual Multicultural Leaders Forum. RPA's comprehensive stroke service makes all the difference to stroke patients. Broadcaster Glenn Daniel's generous gift to RPA's Cardiology Department. Enjoy the best in landscape and floral design Sydney has to offer. The Yaralla Festival returns in 2018 - a great family fun day out at the Yaralla Estate in Concord West, hosted by Sydney Local Health District. Bring the family and pet dog. RPA's Professor Steve Chadban shares what it is like to pass on life changing news to transplant recipients. Celebrating 10 years of the JobSupport Program in Sydney Local Health District, helping people with an intellectual disability achieve employment. Leading health experts talk about the first 1000 days of life, the NDIS, preventing melanoma and healthy ageing. Quick thinking by pilots and crew leads to life-saving treatment by RPA stroke team. Almost $100,000 was awarded to two teams from Sydney Local Health District, for their pitches at this year's Symposium. We go behind the scenes to see a little of what is involved in staging Innovation Week in Sydney Local Health District. Celebrating $1 million of innovation ideas from our staff. We Imagine, Transform, Lead at our showcase event. A $45,000 prize to take a great idea to the next level. Our inaugural Women's Leadership Breakfast was a chance to celebrate and support women, who make up 72 per cent of our workforce. Double-lung transplant recipient Adam Wells talks about the life goal that he's been able to set, thanks to RPA's pulmonary rehab team. We look at some of the highlights from our first Patient and Family Experience Symposium, a perfect way to start Innovation Week 2018. 32,000 colourful glass tiles, sourced from around the country, feature in a new Aboriginal Cultural Garden in the grounds of Concord Hospital. We say thank you to our nursing and midwifery staff. Our community comes together at Kokoda Track dawn service. RPA clinicians discover gene therapy cure for thalassaemia. A kaleidoscope of colour across our health campuses. The new staff carpark at RPA has opened. Calling all nursing and midwifery final year students - consider SLHD! Get Up, Get Dressed, Get Moving, Feel Better is a phrase you're going to hear a lot from now on.